These quirky brooches are made from vintage - retro or unwanted zips that I have collected, disassembled and reworked into a funky flower corsage. They have even been featured on C4 Cleospace and spotted on Shortland st! Their quirky nature means they appeal to a wide variety of people making them a great gift idea. 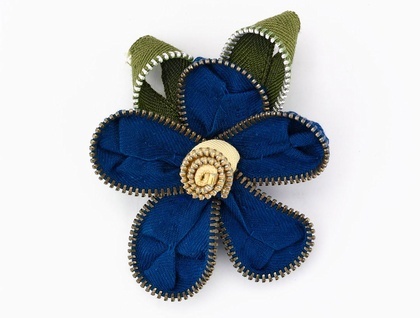 This auction is for one Cornflower blue flower made from a collection of vintage zips. Blue petals with pale yellow centre the outer petals have metal teeth which add a jewel like sparkle. The brooch is carefully assembled by hand and each petal and leaf handstitched. They can also be converted to a hairclip or headband just ask. They have a pin on the reverse side you can pin them to your favourite outfits.